Low-cost servicing for Kia Picanto | What Car? 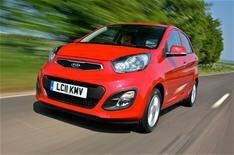 Kia is to offer a low-cost servicing package for its new Picanto supermini. Customers can choose either a three-year or 36,000-mile or a five-year/60,000-mile package. The three-year 'Care-3' servicing package costs 259, while the five-year plan costs 499. The package stays with the car, so it is transferable to another owner. When a customer reaches the end of the three-year servicing deal, they can extend it for another two years for a further 275. Kia expects low-cost servicing packages to be extended to other models in its range.